In our post of the Top 10 Best Electric Skateboard under $300 we discovered that finding a decent electric skateboard for such a small amount of money was actually a pretty difficult task. There are definitely some out there that are worth it, but generally you’ll be sifting through stacks of very subpar boards before you find something worthwhile. So we upped our budget a bit and this time we’re trying a new list – the Top 10 Best Electric Skateboards under $1000. We’re hoping that having a bigger budget will open up the market more and leave us with some nice results. For $1000 we’re expecting a lot more quality, much better performance and a general reliability increase across the whole range. 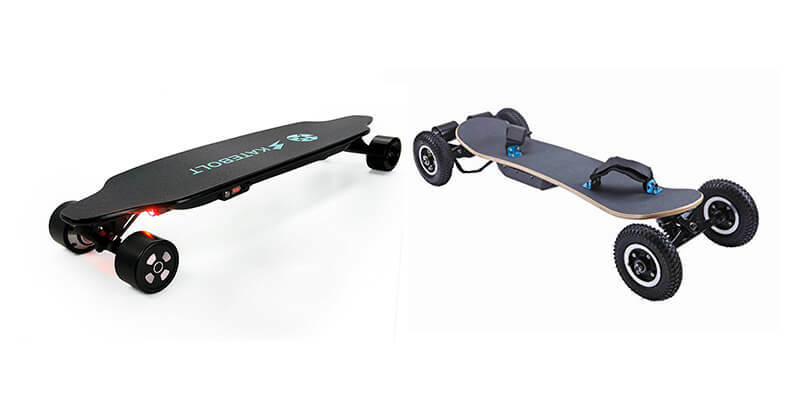 Are Electric Skateboards under $1000 Worth it? At number 10 is the Yuneec E-G02. 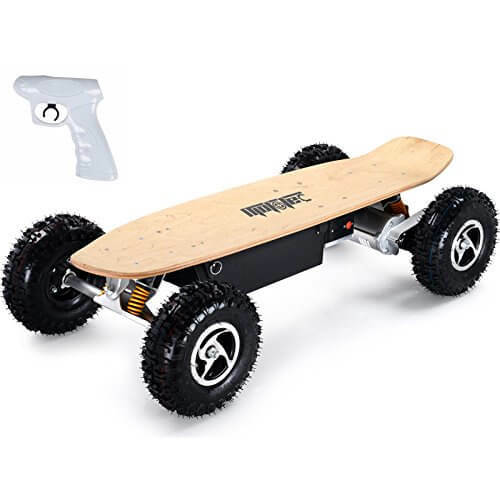 This cheap electric skateboard is made by the same people that make a very popular brand of drone. Using this knowledge they’ve made a very capable electric skateboard. The Yuneec has a very stylish and aesthetically pleasing look. It comes in 3 colors (pink, blue and green) and has a familiar kicktail shape that really helps with control and even tricks. The E-G02 is capable of going up to 15 mph, but like all electric personal transportation this will be very dependant on the rider, condition and terrain. What is also affected by these things is the maximum range that the skateboard can reach. It will generally be able to reach a total of 18 miles on a single charge, which is very impressive. The Yuneec also has 2 riding modes that allows you extra control and will even help save a bit of battery life. Yuneec have even create a mobile app that will connect to your skateboard and let you keep track of your stats and battery levels. This is a great little app that is genuinely very useful. It’s also perfect for people that want to keep everything on their phones rather than having to have multiple additional ways of tracking themselves. Overall, the Yuneec is a good purchase if you’re looking for a entry level electric skateboard that has a bit extra. It’s well built, has some nice features and performs well. For a more in depth look at the Yuneec E-Go 2 check out our full review. For several hundred dollars less than our budget you’ll be able to pick up a Skatebolt Electric Skateboard. For this money you’ll be getting a solid electric skateboard that performs very well. It has an extremely sturdy deck made out of 9 layers of Canadian maple wood. Having so many layers of maple wood allows the Skatebolt to hold up to 280 lbs of weight. The whole board is very well made and feels strong and durable. We feel like you could definitely throw this board around a bit and it’ll still keep going. The top speed and max range of the Skatebolt are very impressive, it has dual brushless hub motors, with a combined power output of 1000W can deliver a max speed of 25 mph. This makes it one of the fastest electric skateboards on the market today. Hidden away under the deck is a 36V, 6600 mAh LG lithium-ion battery which can keep you going for almost 16 miles on a single charge. 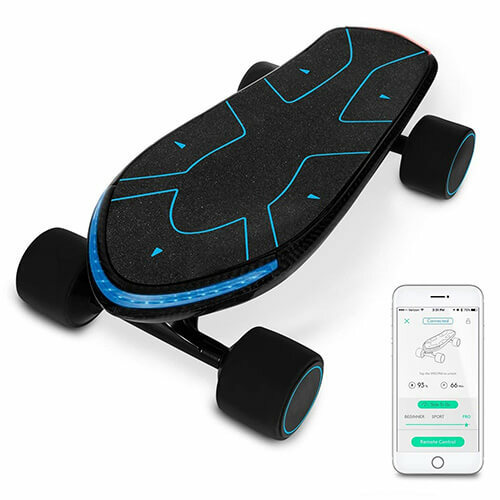 To help you monitor the current battery level, there are indicator lights on the remote, which is a nice touch, in addition to LEDs on the front of the skateboard to help you stay safe. This power also helps it reach a very impressive hill climb degree of 30, which is a lot higher than many other skateboards out there today. The controls are easy and very simple to use. It comes with 2 speed modes and has a switch to easily choose forwards or backwards. It’s electricals are even waterproof so you won’t need to worry about a bit of rain or the odd puddle. Overall, the Skatebolt is a very impressive skateboard. It’s performance is fantastic and it has a few very nice features. The battery has had a few reports of not being as durable as the rest of the board, but we’ve not personally experienced anything like it. The Ninestep Electric skateboard is definitely much more of a mountainboard. As you can see it has big chunky wheels, with pneumatic tires that are perfect for off road riding. It also has two foot straps to ensure that you remain in complete control whenever you’re facing a bumpy road or trail. The Ninestep makes use of two custom high performance brushless motors that give it a top speed of 25 mph. These also produce a good acceleration that makes you happy they included the foot straps! The motors also help it achieve a climbing grade of 30 degrees. The battery is an LG 11Ah battery that gives you a maximum range of 20 – 25 km. The battery can be fully charged in less than 3 hours so you don’t even have to wait that long between rides to get going again. 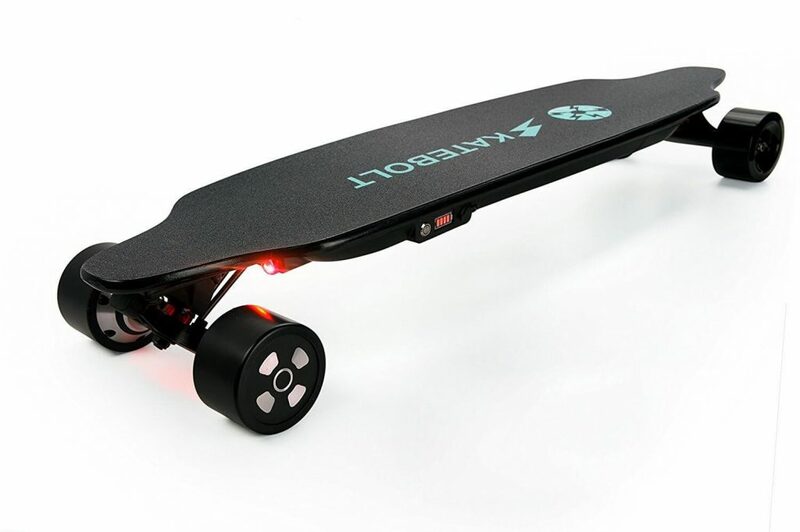 Like many of the boards at this price range, the Ninestep has multiple riding modes that give you more or less power and energy saving modes, it can also go in forward and reverse directions. Don’t think the Ninestep is only suited to off road riding. It’s also a great option for riding on tarmac and can even make a great commuting skateboard. It’s ride is soft and comfortable and if the roads you’re riding to work are a little bumpy it can make a great option to improve the ride into work. It comes in at the higher end of the budget, but you do get a very versatile and rugged board. Overall, a very good buy that we highly recommend. The Atom Electric H16D is a dual hub motor electric skateboard. Think of this like a 4 wheel drive car. You get more traction and generally more control. With the H16D you get two 700W motors that are built into the wheels of the skateboard. This gives a reduces profile and a sleeker appearance and ride. The motors are lightweight and compact and gives the board the feel of a general longboard rather than an electric longboard. The motors will give you around a 20 mph top speed depending on weight and terrain etc. They are powered by a 158Wh lithium ion battery that gives a range of around 12 miles. It can also conquer slope of around 15 degrees. On paper the stats are a little behind some of the bother boards on the list but in reality this will tend to keep up very well. This could be due to its lightweight deck. The deck is a carbon fiber deck that is very light, the whole board, including the dual motors comes in at less than 13 lbs. This also means the board is strong and durable. You could easily throw this board around and it wouldn’t bat an eye. 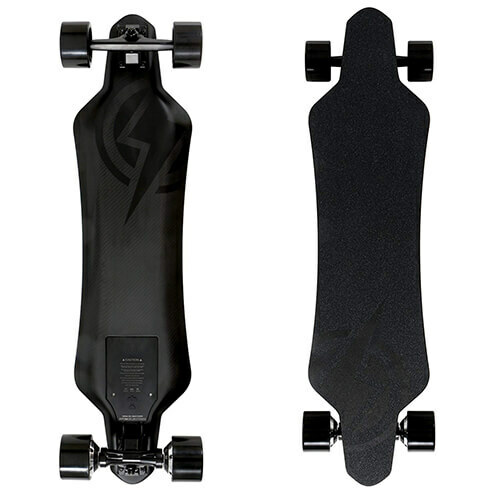 We also really like the aesthetics, the matt black finish looks great and the motors and batteries being hidden away is a nice feature that makes it feel like a normal skateboard. The remote is also just as sleek and well made. It’s wireless with two modes of operation. It also has a battery level indicator which many of the cheaper boards simply do not. Overall, this is a great option if you’re looking for a good looking electric skateboard that doesn’t break the bank. It’s well made, having a fairly unique deck that’s made from carbon fiber. The price is great, giving you a few hundred dollars left over from our budget. A few little nitpicks we have with the board are that the performance isn’t quite as good as we’d like and the ride is a little rough. If you can live with those then you’ll be getting an incredible electric longboard at a very reasonable price. The Mototec is another off road electric skateboard that has a lot of versatility and is very well made. It looks like a classic skateboard except with the addition of a big battery pack and some massive tires. These tires give it the ability to be ridden fairly comfortably on basically any terrain and surface. It’ll manage dirt, sand, gravel, soil and many more. This means you can ride it straight from the mountains, onto the road and straight onto the beach without any trouble. The Mototec is also extremely powerful with a set of two 800W motors giving it a total power output of 1600W. This means it can reach a top speed of 22 mph. It uses a 36V 14Ah battery that’s attached underneath the deck. This isn’t the sleekest design and it can sometimes become a bit of a hindrance if you’re going fast over lots of big bumps. But it does provide the skateboard with a maximum range of around 10 miles. This beefy board is built incredibly well. It has a 12 layer maple deck that is very strong and durable. This and the big 10 inch air filled tires give it the ability to carry riders up to 260 lbs. The Mototec is controlled using a wireless, handheld remote control with variable throttle. This means you are always in control of how fast or slow you want to go and when you want to stop. It also is equipped with an integrated anti lock braking system so you can stop safely. Overall, this is without a doubt one of the best off road electric skateboards on the market today. 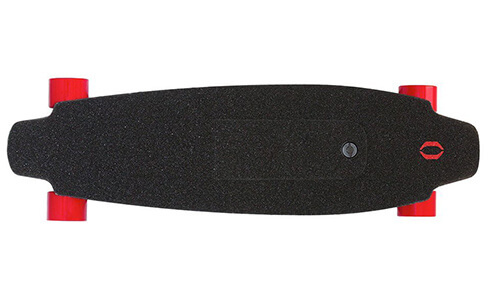 It has great performance, can handle any terrain with ease and will even double up as a great commuter skateboard. We would like to have seen a lower weight, it weight 71 lbs, but this is understandable. It even comes in well under our budget to the point where you could almost buy two of these for the $1000. Just behind the Boosted Board, the Inboard M1 Electric Skateboard is one of the best known electric skateboards on the market today. It’s an e-skateboard that’s built with a flexible wood core and the same fiberglass found in premium snowboards which gives this a lot of strength and reliability. It even included a full 12-month warranty against manufacturing defects. The style is very nice, it’s simple but effective, combining a red and black color scheme. It even has a pair of LEDs at the front to act as headlight. A very nice feature if you find yourself riding at night. The M1 has a max power output of 1600W which gives it a top speed of about 24 mph. It has a maximum range of around 7 miles which is a little low but it makes up for it with another nice little trick. It has a removable battery so when you run out you can easily switch it for another one. What this also means is that you never have to be without power. Whenever you’re riding just make sure you have another battery on charge and you’ll be good to go at any time. Not only this but the battery will fully charge in about 90 minutes. This is much faster than anything else we’ve tested so far. Another feature that Inboard are pushing is the ability to update the board over time using their app. 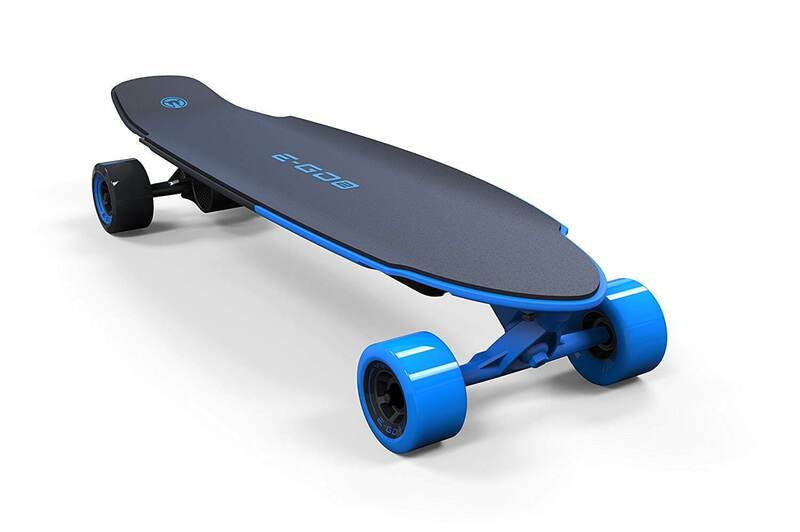 So it’s a bit like the Tesla of skateboards, except not quite as good. The M1 is also water resistant and is approved for air travel. Overall, the Inboard M1 is a great option. It’s fast, the batteries are designed very well and I love the ability to switch them out, despite a fairly low max range. The firmware updates feel a little gimmicky but we’ve not actually been able to test it before and after an update so that’s to be seen. But for an all round great electric skateboard the Inboard M1 is a good shout. The Buffalo Electric Skateboard has a very nice, unique feature that really makes it stand out from the crowd. It first began life on Kickstarter, where it made just over it’s goal to begin full development. The company, based in California, has since developed the board into something a little different from where it began but still a great product. The special feature is the lighting on the underside of the board. It provide a white light for you to be able to see going forwards and a red light behind so people know that you’re there. Perfect for riding in a city or even on quieter roads at night. This really is a nice little feature that could be very useful to the right person. Despite the addition of many lights the Buffalo still manages to reach a max range of 15 miles. It also boasts an impressive top speed of 25 mph. This is due to the implementation of a dual hub system of motors. The Buffalo also includes two driving modes. One being a amatuer mode and the other being an expert mode. In amatuer mode, the board’s top speed is brought down and the system is made a little less responsive to ensure a beginner friendly experience. When you switch to expert mode, the real top speed is available and the controls can help you achieve a much more exciting ride. 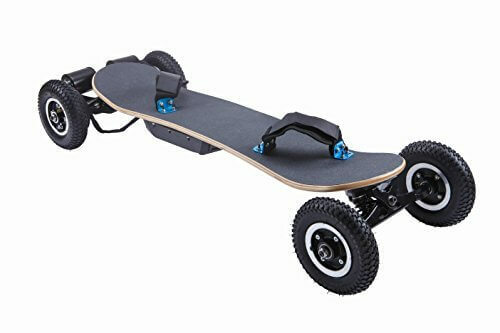 Overall, the Buffalo Electric Skateboard has learned a thing or two from the previous model and is now one of the highest rated electric skateboards on Amazon. 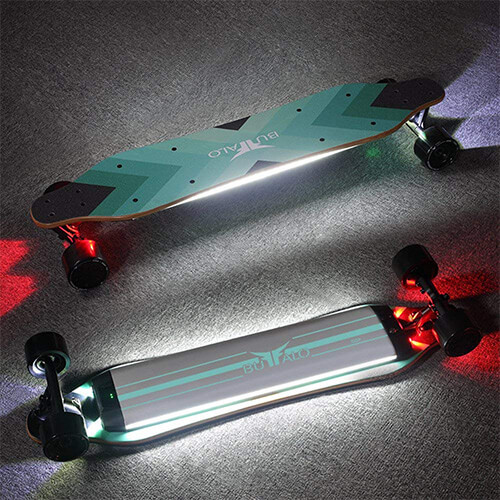 It’s well built, has a great performance in both modes and the addition of the lights is a feature we can see many electric skateboards incorporating very soon. It’s also one of the cheapest electric skateboards on our list. We added the Swagtron Swagboard NG-1 to our list of the best electric skateboards under $300. We’ve also reviewed that board in more depth. It’s a good board with a few problems that could ruin the experience for you. With the Swagboard Spectra however, Swagtron seem to have fixed the problem that the NG-1 has and even improved upon all the positive features. One of the major features that the Swagboard Spectra is offering is a very interesting AI riding system. The board doesn’t have any handheld controls, it’s fully controlled by your body movements. The AI aspect means that there is an artificial intelligence system built into the board that will learn and adapt to the way you ride. The Spectra doesn’t offer quite as good stats as some of the other boards, having a top speed of only 15 mph and a max range of 12 miles per charge. But it is only a mini board and therefore the battery isn’t a big as some of the other boards. It also features a regenerative braking system that helps to top up the battery every time you brake. The board is also able to be controlled through a mobile app. This can control your speed, it can lock the board for you and you can even share photos and more. On the app you can also choose between 1 of 3 modes. From a simple beginner mode to get you riding hands free to a pro mode where you can really open it up. This is one of the most interesting and innovative electric skateboards we’ve seen in a while. It has a bunch of great little features that really make it stand out. The riding style is unique and after a few rides becomes incredibly intuitive and a lot of fun! Whilst this does veer to the higher side of the budget for a low performance we think that the control system is worth the money by itself as it’s such a unique and fun way to ride. We’ve also reviewed many other Swagtron products, such as the Swagtron Swagger electric scooter and the Swagcycle. 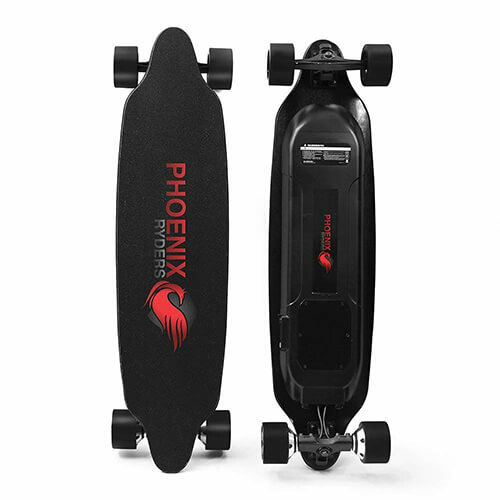 This is the second time we’ve features a Phoenix Ryders board on one of our lists. The other being in the best electric skateboards under $300. This one takes it to a whole new level though. It has dual 500W motors to give a max power output of 1000W. This gives it a comfortable top speed of 25 mph. It can reach a max range of 18.6 miles and can comfortably climb hills over 25 degrees. We love the design of the Phoenix Ryders Dragon as well. It has the popular red and black color scheme which works very well. It’s made from 8 layers of northeast maple which makes it strong and durable and can carry a maximum rider weight of 275 lbs. Like the Buffalo it also has a red tail LED to help you be seen in the dark. It’s controlled by a simple remote control that has all the basic functions you’d expect. This is a solid, high performance and simple electric skateboard that does exactly what you’d expect it to do and it does it well. There isn’t any gimmicks or any crazy riding styles, it takes the traditional ways of riding and makes them great. It also come at a fantastic price and you’ll have over $300 left over from your budget if you buy this. 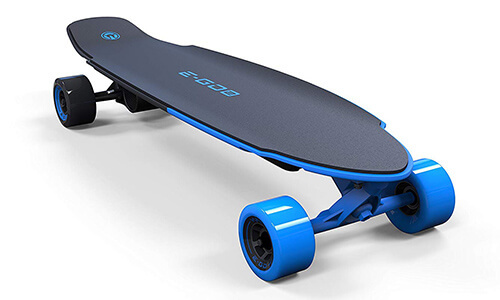 So in first place, our top rated electric skateboard for less than $1000 is the Halo Board 2. This is a fully carbon fiber skateboard that weighs only 14 lbs despite having the highest power of any skateboard we’ve tested. The Halo Board 2 has a dual motor system that provides a staggering 3000 W of power whilst staying virtually silent. This means it can reach a top speed of 22 mph, but it can also keep doing a very high speed up hills due to the huge amounts of torque, which many of the other skateboards on the list simply can’t do. It’s officially rated at being able to climb hills of 25 degrees but will manage more than this. It also has a range of 14 miles and includes regenerative braking. What really stands out with the Halo Board 2 is the attention to detail and the little extra features. For example, one of the best features we’ve seen so far is the handle at the top of the board. It’s surprising how much it gets used when its there. You simply don’t realise you need it until you have it. Another nice feature is the fire safe battery. A nice safety feature that is rarely seen. The wireless controller is also one of the best controllers on any board we’ve reviewed. It has a simple control system, using a little joystick to move it forwards and backwards. But what it also has is a small display to tell you everything you need to know right in the palm of your hand. Overall, you’re not going to get much better than the Halo Board 2. It’s build quality, performance and extra little features make it stand out above the rest. Read our full review of the Halo Board 2 here! Yes! For our list of the best electric skateboards under $300, this question was a little tougher. But with the extra budget we’ve found some very good electric skateboards that are well worth your money. They can go at quite high top speeds, and when you’re so close to the ground with nothing to hold on to, there’s nothing quite as exhilarating. Especially when you start getting good and begin to master the controls, this is when the fun really ramps up. If you’re new to electric skateboards, or are a completely beginner skateboards in general we do think that a cheap electric skateboard such as the ones that we’ve reviewed today can be a good purchase. Should you buy at this price point, go cheaper, or more expensive? That depends a lot on your personal circumstances, if you’re able to fork out over $1000 then it might be worth picking up something a little better. But honestly, the Halo Board 2 and a lot of the other skateboards that we’ve mentioned are well worth your money and probably provide better value for money that something like a Boosted Board. If you’re looking for the best of the best then spending more than $1000 is probably required, but if you’re looking for a solid skateboard that performs very well, has great build quality and provides a lot of value for money, then this price range is perfect. Skateboarding and electric skateboarding involves a wooden plank with wheels reaching potentially very high speeds with the possibility of performing tricks on streets and in skate parks. It doesn’t matter if you are an experienced rider or a novice learning the basics; sooner or later, you’re going to fall. Safety gear is there to protect those vital points when the inevitable happens. It really good to see this type of blog which provides me a complete view about the top 10 currently available electric skateboards. I was just looking for some good reviews about skateboards. I need to buy one and I will start to ride on immediately. Here you have shared the full description of the skateboard, its marketed price and after that it is easy to select skateboard on amazon shopping blog by clicking on “View on Amazon” button for Top 3 selected skateboards.